Today, I will explain the Second Method for performing the Risk Assessment Study: Software Method. As we see in the previous Articles of the First Method: Manual Method (Equations and Tables Method) that the Manual Method is time-consuming and not always easy to apply the procedures and data given. Today, I will explain the first software: Strike Risk V5.0 as follows. 1- Why using StrikeRisk V5.0? 2- How to use StrikeRisk V5.0? After you install the program from the download link provided in the end of this Article, a StrikeRisk icon is displayed on your desktop. Click Purchase the product, if you do not have a valid hardware lock, then click Ok. Your web browser will open and take you to the StrikeRisk internet pages where you will find details about purchasing StrikeRisk. Double-click the strike risk Icon on your desktop. The following dialogue box is displayed (Fig.2). At the top of the dialogue a message indicates the number of days remaining before the program must be activated to run. Click Run the product (If the 15 day limit has not expired), then click Ok. The program splash screen is displayed and the user Interface is loaded (Fig.3). The Title bar (Fig.4), which is a horizontal area at the top of the StrikeRisk window, provides the filename of the currently Open Project. The menu bar (Fig.5)is located at the top of the StrikeRisk window and contains the names of the Individual menus of the application. To open a menu, click it with the mouse or press the ALT key together with the underscored letter in the menu name (for example ALT + F for File). Each menu displays a list of commands. Some of the commands have images next to them so you can quickly associate the command with the Image. Some menu items branch into submenu Items (for example Maps). If suspension points (...) appear after a menu Item (for example for File, open Project), this means that a dialogue box is opened when you execute the command. Shortcut (or pop-up) menus are available when you right-click text, objects, or other Items. The Toolbar contain buttons with Images (the same Images you see next to corresponding menu commands) that can be used to directly execute frequently used commands. The function of a button is displayed when you position the mouse pointer over a button and hold it there for a short time (Fig.6). If a button is grayed out, this means it is not available at present. StrikeRisk Includes a Standard Toolbar that you can show and hide as needed. By default, the Standard Toolbar is docked below the Menu bar. The Project Explorer in (Fig.4) displays the status and make up of an open Project file. The Project Explorer shows all of the Case files that make up the current Project, whether Cases are open or closed and whether or not Cases require saving. The Case Explorer in (Fig.4) lists all aspects of the currently selected (open) Case. The Case Explorer can be used to accomplish tasks such as adding or removing Structures, Lines and Zones. The Case Explorer also provides an easy means of navigating through a Case. The Summary pane in (Fig.4) displays the key results of the currently selected (open) Case. All four primary risks are shown along with their direct and indirect components. Risk results are color coded to quickly Identify if they are higher (red) or lower (green) than their tolerable value. By default the Summary pane is located at the bottom of the StrikeRisk Window. The Status bar in (Fig.4) is a horizontal area at the bottom of the StrikeRisk window. It provides the full path and filename information about the currently selected Case. The Case pane in (Fig.4) is the area in which all currently open Cases are shown. The Active Case in (Fig.4) is the currently selected (open) Case and is displayed In front of any other open Cases. Press the left mouse button and drag left or right. The pane is resized after you release the mouse button. Note: The program maintains these settings until you adjust the panes again. 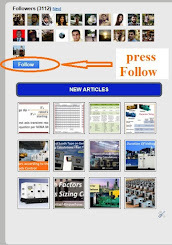 Press the left mouse button and drag up or down. The pane is resized after you release the mouse button. By default all toolbars are displayed across the top of the window below the menu bar. You can move these toolbars to any location in the window. Press and hold the mouse button while you drag the Toolbar to a suitable location in your window. Release the mouse button to drop the Toolbar to Its new location, it will remain In this new place until you move it again or close It. By default the Standard Toolbar is open and displayed across the top of the window, below the menu bar, you can open and close this (or any other) Toolbar whenever necessary. From the View menu, select Toolbar. The open toolbar displays a check mark on the left. The closed toolbar does not display a check mark on the left. By default, the Summary pane is open and displayed across the bottom of the user interface, below the Explorer pane and Case pane. You can open and close this Summary pane whenever necessary. From the View menu, select Summary. When open the Summary menu item display a check mark on the left. When closed the Summary menu item does not display a check mark on the left. Please, see the paragraph First: Opening the StrikeRisk program in above. From the File menu, select Exit. Note: You may be prompted to update and or save files before the program Exits. 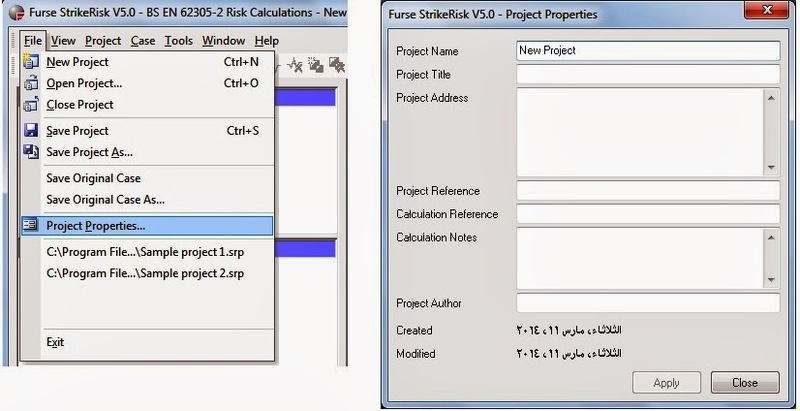 Use the following procedure to create a new StrikeRisk Project or open an existing Project. A new Project opens with a single Case (based on the Case template) loaded. 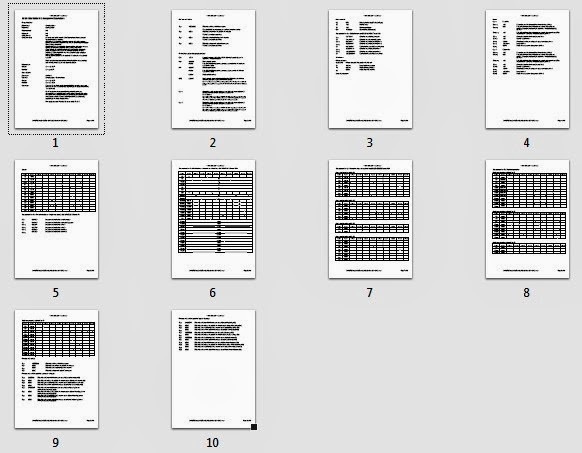 From the File menu, select Open Project (Fig.7), The Open Project dialogue appears. In the Open Project dialogue, click the Look In dropdown box and browse to the directory where your Project files are stored. 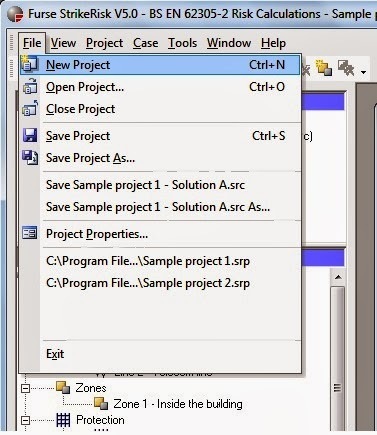 Select the required Project file. Click Open, The chosen Project opens. To see examples of StrikeRisk Projects open the sample projects in (Fig.7) that are included in the StrikeRisk installation. The sample projects are located in the Samples subfolder of the location where you Installed StrikeRisk. The following is a recommended strategy for developing a Project within StrikeRisk. Not all of the tasks are necessary to develop a Project, but you will probably want to complete most of them. The heart of each StrikeRisk Project is its Cases. Each Case is a separate risk assessment in its own right. Each Case is used to carry out a series of calculations using relevant formulae to determine the actual risk R for the Structure under review. enter a number of dimensions and various weighting factors relative to the Structure, along with various assigned values from the appropriate tables in Annexes A, NB and NC of BS EN 62305-2. All of the foregoing can be entered or is accessible within each Case. If the result shows R <= RT then the Structure is adequately protected for a particular type of loss. If the result shows R > RT then the Structure is not adequately protected for the type of loss, therefore protection measures need to be applied. These protection measures are determined from relevant tables given in BS EN 62305-2 (typically tables NB2 and N83). The above steps can be set within each Case. The aim, by a series of trial and error calculations is to ultimately apply sufficient protection measures until the risk R is reduced below that of RT. 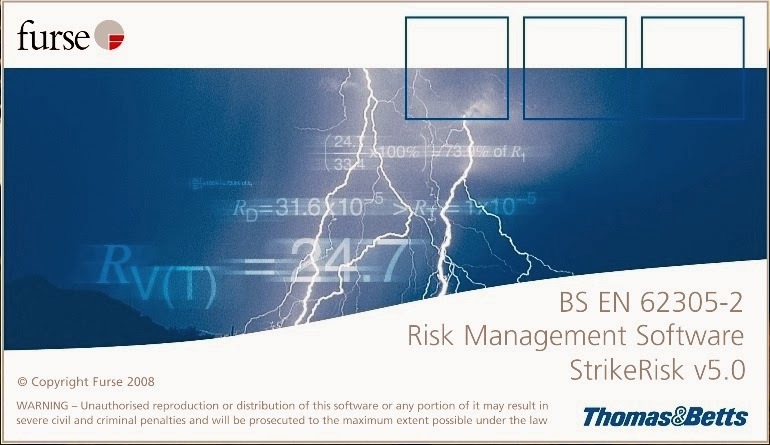 The ultimate aim of StrikeRisk is to produce the results of BS EN 62305-2 Risk Management calculations in a format that can be passed to a customer or easily incorporated within the documentation of an engineering project. StrikeRisk allows you to review/generate a number of different forms of output. A number of program options can be set via the Options dialogue which can be accessed via the Menu. From the Tools menu, select Options (Fig.11). The Options dialogue opens (Fig.12). Setting the font color for Risk results that are acceptable or excessive. Determined by graphical means following Linear Interpolation of the ranges given In Table NB.4 of BS EN 62305-2. The second method will lead to a more accurate assessment of factor PMS. Open the Options dialogue box (Fig.11). Open the Options dialogue box. For more Information see StrikeRisk Options - Overview. Click the Interpolation of Kms values tick box (the box is now empty). 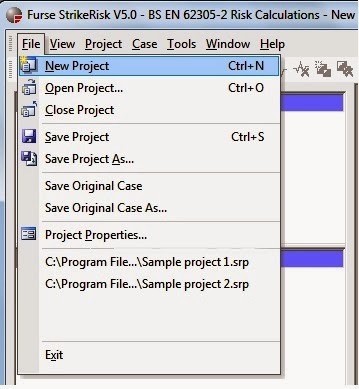 The Open last Project option allows the user to run StrikeRisk and automatically load the last opened Project. Click the Open last Project tick box (a tick is now displayed)(Fig.12). When StrikeRisk is next opened the last Project will be automatically loaded. Click the Open last Project tick box (the box is now empty(Fig.12)). When StrikeRisk is next opened no project will be loaded. The Full report template is used every time a report is generated from the Report tab of an open Case with the Full Report option set in the Report tab toolbar. The Full report template may be altered to allow for different types of project or different clients. Report templates may only be altered via a licensed copy of Business Objects Crystal Reports software. Click the Full Report button (Fig.12). The StrikeRisk Report Template dialogue appears. In the StrikeRisk Report Template dialogue, click the Look in dropdown box and browse to the directory where your Template files are stored. Select the required Template file. Click Open. The chosen Template and full path are displayed. The Summary report template is used every time a report is generated from the Report tab of an open Case with the Summary Report option set In the Report tab toolbar. The Summary report template may be altered to allow for different types of project or different client. Click the Summary Report button (Fig.12). The StrikeRisk Report Template dialogue appears. The Case template is used every time a new project is started (with a single default Case) or a new Case Is added to a project. The Case template may be altered to take into account the standard components and details that are common to all risk assessments a user wishes to make. Multiple templates may be created to allow for different types of project or different clients. For example the standard template shipped with StrikeRisk sets up a case with no Lines and one Internal Zone. The user may wish to start all new projects with two default Lines (power and telecom) and two Zones (outside the structure and inside the structure). The user may also wish to set certain default details e.g. the Identification for the two Lines, the soil resistivity, the Project properties, the Case name etc. Create a new project (Fig.7). 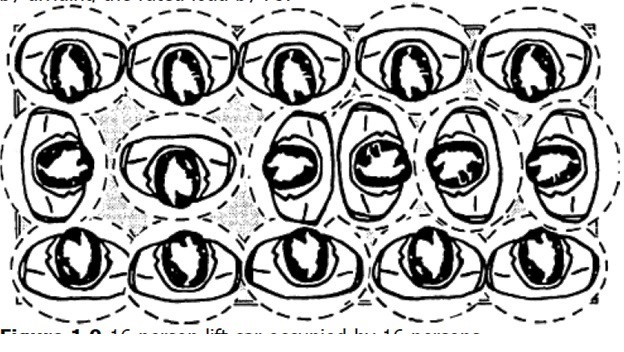 Open the default Case 'Original case'(Fig.13). Save the Case to the StrikeRisk Templates folder 'C:\Program Files\Furse\StrikeRisk 5.01/Templates’. Give the file a new name rather than overwriting 'New solution.src'. Close the Project without saving the Project file. Click the Case Template button (Fig.12). The StrikeRisk Case Template dialogue appears. In the StrikeRlsk Case Template dialogue, click the Look in dropdown box and browse to the directory where your Template files are stored. Now try creating a new Project (Fig.7) and examine the default Case. 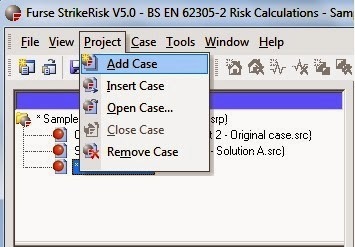 The color selection chosen is used in the Summary Pane, the Case Explorer and the Component Risk tab of a Case every time a result is less than (acceptable) or greater than (excessive) its tolerable risk. Open the Options dialogue box (Fig.12). Click the Color selection, tolerable risk button for either acceptable or excessive risks. The Windows Color dialogue appears. In the Windows Color dialogue, choose a color from either the basic colors or click Define Custom Colors and choose a custom color. Click Ok. An example of the chosen color is displayed. Click Apply to close the options dialogue. To download your copy of StrikeRisk V5.0, please click on the link. Click on the phrase “Join this site" in bottom of the home page, above the images of our members. In the next Article, I will explain other Software for performing the Risk Assessment Study. Please, keep following.